“I found your website and it has proven quite useful so I thought I would share. His name is Gizmo, Gizz or Gizzy depending in how much trouble he is in. I'm not too sure on the age but somewhere between eight and ten would be a good guess. 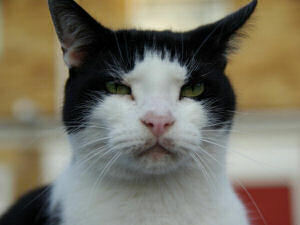 He is an ex-rescue cat from Battersea in 2005 along with his sister Fizz. An eventful start to our relationship saw him spending a large amount of time in captivity after being hit by a car and breaking his leg. The years in-between have been nothing if not interesting! He was diagnosed towards the end of last September. The usual symptoms of over-drinking, over-eating and a general lack of well-being saw me down to my local vets, where a urine and blood test confirmed that he was in fact diabetic. A few practice runs with injecting distilled water with the vet and then I was on my own. Now nine months later I could inject him with my eyes shut, but it has not been plain sailing all the way. We have had two hypo episodes which thankfully passed after a day in the vets and his dosage has ranged from 1 unit, to 3 units, to 5 units once a day to his current dosage of 2 units twice a day. Up until todays vet visit we were on PZI but after a few weeks of poor responses we have changed to Caninsulin.